November 1, 1930 was a busy day for Victoria Mayor Herbert Anscombe. Not only did His Worship officially open the Gorge Vale Golf Club at 2:30pm, he also picked up a telephone and inaugurated dial service for Victoria, exchanging pleasantries with Lieutenant Governor Robert Bruce, Premier S. F. Tolmie, and the Governor of Washington State. Reports from the day indicate Mayor Anscombe was in particularly jovial spirits as he entertained the crowd with a fitting and humorous address before smacking a drive down the long and beautiful fairway, on his third attempt. The double wiff was rumored to be greatly amusing to Esquimalt Reeve James Elrick, understandably peeved at the Victoria Mayor gaining top billing in his jurisdiction. The pioneering members of Gorge Vale were also in excellent spirits as they gazed out upon the fairways and greens of Victoria's newest shrine to the ancient and glorious game of golf. 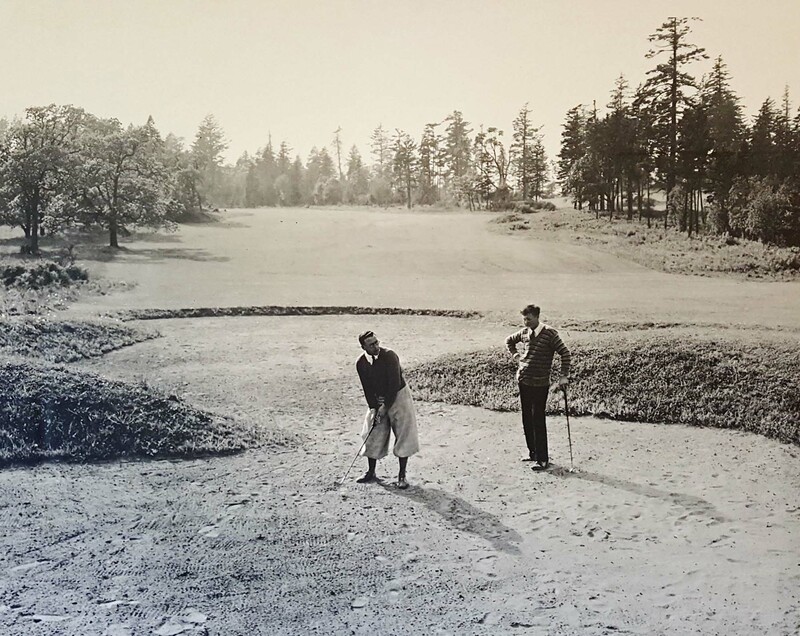 For this day was the culmination of a dream first recorded in Spring, 1924, when bylaws for a new golf club in Esquimalt were originally drafted. Mysterious, or simply unrecorded, activity regarding the acquisition of land and potential financing schemes stuttered along over the next three years. After all, negotiating an advantageous deal with the Puget Sound Agricultural Society, the benevolent sounding landholding subsidiary of the hard nosed Hudson's Bay Company, was no easy matter. The spring of 1927 germinated significant activity with the first formal meeting of the membership scheduled for Friday, June 24. The purpose of the meeting was to authorize the formation and registration of the company, confirm the agreement of the purchase of the land and other necessary business, specifically beginning the long and tortuous attempts to finance and develop the golf course and clubhouse. A good crowd turned out June 24th at the Chamber of Commerce auditorium to hear the first of many financing schemes for the new golf club. The plan was to have three classes of shares in the new company. While all shares would cost $100.00, class 1 shares would be paid in full on application; Class 2 shares paid $10.00 on application, with $5.00 dues on July 25th and each succeeding month until paid for; Class 3 shares paid $10.00 upon application and $10.00 per year until fully subscribed. To sweeten the deal, the Committee guaranteed a dividend of 5% per annum for ten years on Class 1 shares, and 5% per annum for eight years on Class 2 shares. In the words of acting secretary Shewell Morris: "The members will appreciate the fact if 600 shares are sold under Class 1 and 2, the Directors will not have to raise any money by bonds to construct the course and build the clubhouse. The Committee urges as many members as can possibly afford to do so, to avail themselves of this excellent investment". Why 600 shares for a full membership of 450 - Easy. Canny investors were meant to pick up the extra shares. If not for the aggressive 5% coupon, then for the altruistic thrill of kick starting this golf club with some serious up-front money. Mr. Morris's aggressive sales pitch fell somewhat short, however, and despite raising $5,500.00 through share issuance in 1927, more money was required to begin construction. Luckily a lack of cash on hand is no deterrent to tenacious visionaries, and planning for the club began in earnest over the fall and winter of 1927-28. Mr. F. G. Aldous, professional engineer and land surveyor, staked out 143 acres in September and an amount of $60,000.00 was agreed upon as the price owed the Hudson's Bay Company. Thus surveyed, the next important decision was to engage a worthy club architect to transform, on paper at least, this 143 acres of wooded wilderness to an eighteen hole championship golf course. After some debate, the Committee decided to approach the leading golf club architect in the Pacific Northwest, Mr. A. Vernon Macan. Trained in Ireland, Mr. Macan had already designed a number of top quality golf courses in Oregon, Washington (Fircrest Golf and Country Club), and British Columbia (Royal Colwood). Golf architect by trade and businessman by nature, Mr. Macan readily agreed to take on the project, receiving five full shares as a down payment for his labours. The crucial task of design now underway, Secretary Treasurer Mr. Morris, with the support of President Fyvie and the other directors, turned his attention to other pressing tasks: dodging creditors and soliciting additional capital. The Royal Bank was becoming a particular nuisance in early 1928, seeking payment of an overdue note. The Bank notified President Fyvie that the note, not being provided for despite repeated promises, was to be placed in the hands of a solicitor, at week's end, for immediate suit. "While loathe to make a threat of this kind," the bank manager commiserated, "you seem to have failed entirely to appreciate that your failure to provide for the debt has placed the company in a very unfavorable light insofar as the bank is concerned". Letters of this sort were not uncommon over the next few years. Undeterred, Mr. Morris trotted downtown for visits with financiers Branson, Brown and Company and subsequently, R. G. Christy and Company Ltd.. The former graciously declined to underwrite the proposed securities, citing customer indifference. Mr. Christy, however, an investment banker by trade, enthusiastically endorsed the venture and on July 3, 1928, the Committee floated a $60,000.00 first mortgage, 7% Twenty Year Sinking Fund, Gold Bond Issue. Heady financing for sure, but virtually everybody had some familiarity with the stock and bond markets in 1928. Reports indicate this ambitious undertaking fell somewhat short of expectations, but generated sufficient revenue to keep creditors at bay while proceeding with construction. With finances low and expensive water requirements high, the Committee had little choice but to appear before the Victoria Water Committee, cap in hand, to solicit discounted water rates. At which point, a pompous Victoria Councilor, Alderman Woodward, informed the Committee that he and his fellow colleagues were bound to "conduct the affairs of the City on behalf of the ratepayers. Why should the City give cheap water for the golfing pleasure of ten thousand leisure persons?" Thanks are due to the Victoria Daily Times who editorially chastised Alderman Woodward for his newly acquired zealotry on behalf of ratepayers. Evidently, the previous July, Woodward had hatched the ridiculous proposal of spending $10,000.00 of Victoria money as a down payment on the purchase of a farm in Cobble Hill for Prince George, the Duke of York. After unsuccessfully trying to gag the press, Woodward's ludicrous plan melted away at the light of day. "After all," the newspaper chided, "Why wasn't a dedicated and energetic monarchist like Alderman Woodward aware of the fact that Prince George was a sailor, not a farmer". The Committee receive a meager, but satisfactory, consideration on Gorge Vale water rates. 1929 dawned hopeful, and full of roaring twenties spirit. Fortunately, an ominous foreboding did not cloud the pioneer's vision. Construction activity began in earnest in the Spring. On June 9th, The Daily Colonist, in a detailed review of the layout, commented: "Now the clearing is completed it becomes apparent that the new links in Esquimalt will combine natural beauty with perfection of design." With clearing completed and fairways ploughed, members gave freely of their time to form work parties, and many, unable to physically participate, donated money to cover a days wages for a working man. Reviews were clearly positive, as noted in the Daily Colonist Time: "There is no fairway which has not an individuality of its own, each vista, as it is opened up, seeming to accomplish the impossible and surpass its predecessor in beauty. One of the most remarkable features of the golf course is the fact that, in spite of its proximity to the city, it gives the sense of being deeply buried in the country. Only for some three hundred years is it bounded by the Tillicum Road. For this, the narrow point of a wedge, it plunges into the country pure and simple." October 29, 1929 was a day that had reverberating impact worldwide and Gorge Vale was no exception. Mr. A. Vernon Macan was certainly a man not blind to opportunity. On October 30th, Mr. Macan wrote to Mr. Morris regarding his observations during a recent visit to Victoria and the golf club. "I see work on the golf course is progressing," Macan wrote. "Incidentally, the pipe I saw being laid down the middle of the 17th fairway struck me as being very small for the purpose it will have to serve. I have explained to you that the necessity of adequate drainage pipe in this area could not be exaggerated." Small talk aside, Mr. Macan now bore down to the meat of his correspondence. "I, of course, do not know what arrangements your directors have made for the financing of Gorge Vale Golf Club. I would, I must say, be interested if the Club is unable to complete their development and desire to realize their equity in the proposition. I am in touch with financial interests who are prepared to purchase that equity, not with the idea of subsequently developing the Club on its present course, but as an entirely new proposition, the nature of which I am not at liberty to divulge." Such was the regard businessman Vernon Macan held for some of the finest work ever achieved by noted golf club architect Vernon Macan. The Directors politely informed Mr. Macan that they had no interest in entertaining his proposal. It was decided that nine holes would be built first, and the course opened. Once members were playing and green fee revenue generated, it was hoped that the second nine could be concluded. For reasons not explained, probably financial, the Committee choose to develop the back nine first. Adversity bred good fortune though, and generous gifts from a few wealthy patrons was one stroke of luck. Another occurred when the Club hired Bill and Dave Gove, two strong and determined greens keepers from Scotland. Bill assumed the position of course Superintendent and put his shoulder to the wheel. The Ford tractor rolled and a brand new Pennsylvania Qunit mower was ordered direct from Philadelphia, PA. In Spring, 1930, the baton was passed from pioneers to players, as Lieutenant Colonel Alen A. Sharland was elected Club President, and James G. Smart was appointed Club Secretary Treasurer. Wonderful speeches and toasts were offered in acknowledgment of the tireless efforts undertaken by outgoing President David Fyvie and retiring Secretary Treasurer Shewell Morris. November 1, 1930, brought the Committee home. After Mayor Anscombe's opening pleasantries and eventual crack of the ball well down the tenth fairway (then a par four), an inaugural match was held. Famous Victoria golfers Harold Brynjolfson and Harold Lineham were paired against Norman Wallace and Art Beasley. Brynjolfson, Uplands and City Champion, and Lineham, the crack shot from Colwood, were to be opposition. Wallace, Colwood Club monarch, and Beasely, star Oak Bay southpaw, flew the colours of the new Club. They all had fine drives off the first hole, and the Gorge Vale Inaugural Tournament was underway. Wallace played exceptionally well over the front nine, with he and Beasely enjoying a three hole lead at the turn. Brynjolfson and Lineham mounted a charge on the back, but came up short. The Gorge Vale reps were victorious. A great party then celebrated this happy day.